When was the last time you (willingly) changed-up what you drank in the morning? And how much did you change it up? 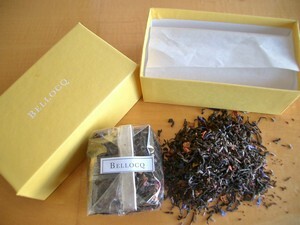 The Accidental Locavore was pondering this, switching blends of tea not once, but three times this week. Which got me to thinking, do you eat and drink the same thing every morning? Go for more variety on the weekends? I’m pretty much tied to a big mug of tea and a bowl of yogurt with granola and berries during the week, and an omelet on the weekends (lovingly cooked by my husband). How about you? My big shot at variety wasn’t for anything more than being attracted by a pretty face, or in this case, a beautiful package. 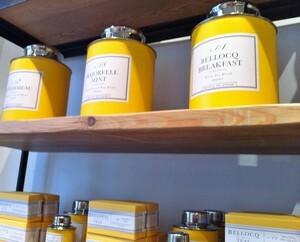 One of the things at Haven’s Kitchen that really caught my eye was a shelf devoted to Bellocq tea in sunny yellow-wrapped tins. Being an Earl Grey fan for years (Fortnum & Mason’s Smoky Earl Grey to be specific), the Locavore looked for a reasonable substitute and was directed to “The Queen’s Guard,” a smoky blend with flowers, the tea being almost as beautiful as the packaging. This morning, I went for a blend my mother brought, an interesting Organic Earl Grey from Mem Tea, a local Boston importer, something I’d tasted and liked in a restaurant up there. While the nose is pretty much identifiable as a Earl Grey, the taste when brewed has a lot of cinnamon, not something normally associated with Earl Grey. It won’t become my go-to cuppa but it’s good for switching it up on an occasional weekend. And how was the blend bought mostly for its good looks? Again, it won’t be my every morning brew (why use something that can be bought locally when you can bribe people going to London?) but it’s got a nice smoky taste with a little sweetness from the flowers. It’s not overwhelmingly fragrant, a plus in my book. It’s possible I’m just a sucker for great packaging, but you try opening a sunny yellow box and pour out tea with pink and blue flowers, and see if your day isn’t a little brighter. This is an amazing and simple tomato sauce the Accidental Locavore had at the gnocchi class at Haven’s Kitchen. It’s very simple but takes time for the tomatoes to cook down and develop their incredible flavor. Makes a lot, so be prepared to have a big pasta party, can or freeze. In a medium-large pot over medium heat, add the tomatoes. Bring to a simmer and lower heat to medium low. Season with sugar and salt, to taste. 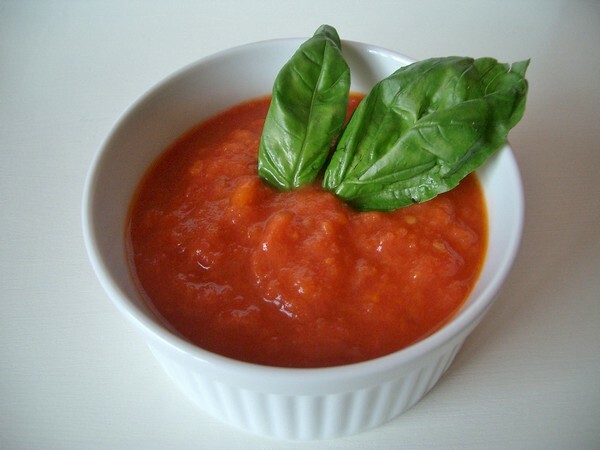 Tomatoes should simmer low and slow for 1 ½ -2 hours. While the tomatoes are cooking, prepare the flavored oil. 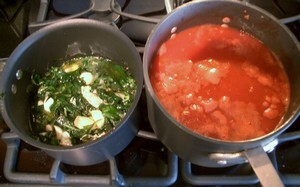 In a small pot add the olive oil, basil and garlic, and bring to a simmer over low heat. Simmer for 30 minutes, still on low heat or the garlic will overcook and burn. Remove from heat and add the red pepper flakes. Let sit until the tomatoes are cooked, at least 30 minutes. When the tomatoes are ready, strain the oil directly into the tomatoes. You just want to add enough of the oil to flavor the tomatoes ( I used it all). If you have any leftover oil you can use it for the table, for dipping bread into. After straining the garlic and basil oil, remove the garlic, peel and use as garlic confit. I pureed mine and use it for salads and vegetables, delicious! In the summer time, you can make this same recipe with 2 parts fresh tomatoes (peeled and seeded) to 1 part canned tomatoes. For a long time the Accidental Locavore has wanted to learn how to make gnocchi, one of my favorite forms of pasta, but classes never worked with my schedule. 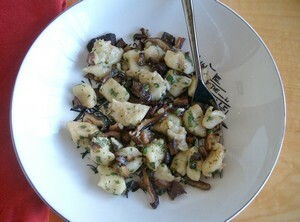 When Haven’s Kitchen had a gnocchi class that did fit, it seemed like a perfect opportunity. And wouldn’t a sparkling new kitchen be just the place? As it turns out, making gnocchi is pretty easy. It’s just like making pasta, with the added step of cooking and ricing potatoes. Unlike pasta (and more like making biscuits) you need to have a light touch. What was surprising was how delicate the dough was, which was good because you automatically started to treat it with respect. Bring the potatoes to boil in a saucepan filled with cold water* and a big handful of salt. The water should be salty enough to taste like the sea…seriously! When the potatoes are tender, about 15 minutes, drain them and put them through a food mill or potato ricer into a large bowl (wide and shallow is better than tall and deep). Gently push the potatoes to the sides of the bowl to form a well at the bottom of the bowl. Add 1/2 cup of the flour to the bottom of the bowl. Add the beaten eggs and top with the remaining 1/2 cup flour. Very gently, starting in the center, start to mix the eggs and flour. As they become combined, start to gently stir in the potatoes. When the dough is well-mixed, but not over-processed, turn it out on to a well-floured board. If it’s not completely mixed, knead it a couple of times** until everything is thoroughly combined. Form it into a rectangle about 1″ thick. Cut the big rectangle into 1″ strips. Lightly flour your hands. Take one of the strips, sprinkle with flour and gently roll into a long rope about 3/4″ thick. Cut the rope into 1/2“ (or bigger depending on how large you want your gnocchi) pieces. Place the pieces on a parchment-lined baking sheet. Bring a large pot of salted water to a boil. Again, gnocchi like wide and deep, rather than tall and narrow, so use your widest pot. Cook the gnocchi until they start to float to the top, about 2-3 minutes, depending on size. Toss with your favorite sauce, serve and enjoy! * Here’s something the Locavore learned: the reason for the cold water is potatoes won’t cook evenly in hot water (the centers never catch up with the outsides). **Something else I learned, always knead in the same direction, gluten likes a one-way street. Thursday, the Accidental Locavore was wandering around Chelsea checking out two newcomers, Haven’s Kitchen and the Startup Shop (beta). 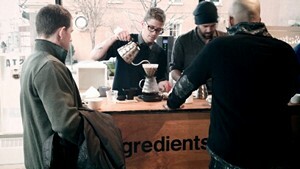 Over the weekend, a Startup Store (beta) was hosting Coffee Common. Don’t let the name fool you for a second, there is nothing common about these coffees or the baristas flown into teach you how to brew a perfect (obsessive) cup. The store is an interesting concept, starting in February (when it moves out of beta, whatever that means for a retail store…before you know it we’ll have restaurants or plays in beta…save me), there will be a new collection organized around a theme, February’s being “Love”. But for now, there are a lot of coffee geeks standing around several well placed bars, seriously sipping extremely carefully brewed, organic, fair-trade coffee made for them by champion baristas. Oh, and please don’t make the mistake the Locavore did and innocently ask if there is either anything to drink besides coffee and/or if there’s milk and sugar for it. Didn’t I tell you this is serious obsessive stuff? Therefore, nothing must get in the way of the true coffee experience. Not being a coffee fan, I’m out of there, but looking forward to checking back in next month. Don’t you think love is more interesting than coffee? On to a much more pleasant newcomer: Haven’s Kitchen. 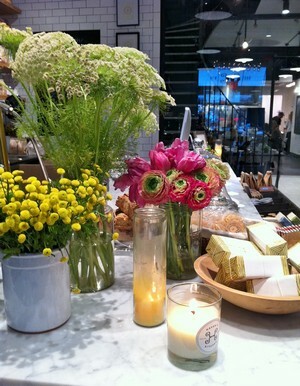 Run by Alison Schneider, it’s a beautiful carriage house in Chelsea. Possibly because it just opened the day I was there, or more probably, by design, it truly feels like a haven. While a Startup Shop feels like a place curated by geeks, Haven’s Kitchen is simply a pleasure for all the senses. The retail space is big and open, with some gorgeous tea tins on the left and everything you would need for making pancakes (or for giving as hostess gifts) on the right. There’s a big hunk of marble in the center and a coffee bar beyond that. 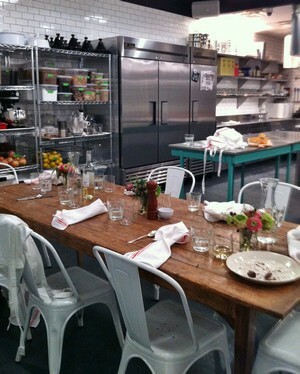 In the back, is the space for cooking classes and a spiral staircase going up to a private dining room. Alison is committed to presenting sustainable food in a communal (in all the best senses of the word) setting. The cooking classes run the gambit, from basics, like knife skills, to more advanced/adventurous: fonds and charcuterie. The upstairs dining room will be available for private parties and monthly Supper Club (can’t wait to check that out!). Unfortunately, when the Locavore was there, I only had a few minutes to scope out the place, but I am definitely going back next week for a more leisurely perusal. Which would be your preferred haunt?